Swing into the fun at your next birthday celebration or event. 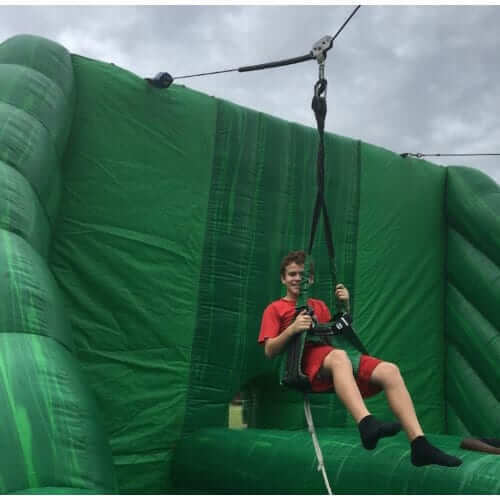 We have an inflatable zip line rental in Dallas. Starwalk of Dallas provides top quality zip lines rentals. They are large but reasonable. They are expansive yet affordable. We have your inflatable rentals to the entire DFW metroplex. At 70′ long and 36′ high, our Amazon is perfect for thrill-seekers of any age. We have upgraded safety features. Of course, our mission is to provide you with a safe any easy rental experience. We also want you to have an EPIC time. As such, we pride ourselves in having the cleanest rentals. We also have flexible scheduling policies. Our service is second-to-none customer service. Just click on our quote request and the customer service team will quickly send you a free quote. Staffing is required for the Amazon zip line rental based upon the participants and traffic flow. We typically staff our inflatable zip line rentals with 3 to 4 attendees. For events with elementary age children, 4 attendants are required to allow support in unbuckling the seats at the end of the ride. At Starwalk of Dallas, we understand how difficult the party planning process is. We make the rental process as easy as possible at every stage. Just select our zip line rental product above and our customer service team will quickly send you a quote. Starwalk of Dallas is a full-service party rental company. This means we handle everything from delivery to setup to tear down. Our team will even help you plan your event and select the right products if you don’t know where to start. 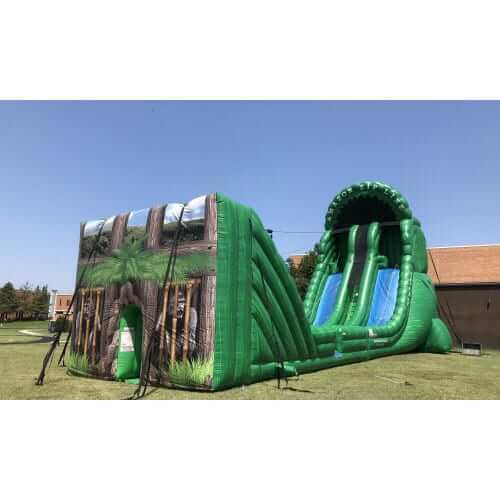 We have one of the widest selections of party rentals in Dallas. 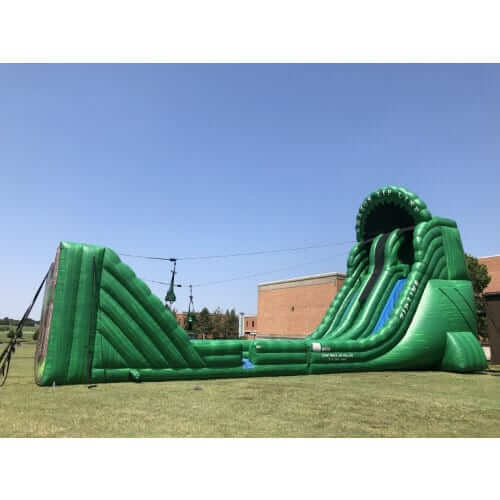 Our inventory includes inflatable games to water slides to dunk tanks. We are fully equipped to handle any sized event— large or small. We deliver to corporate luncheons, school carnivals, community festivals, church events, and more. If you’re having a large event, we even offer discounts. Contact us now at (214) 340-6666 for a FREE quote. Serving the Dallas, Richardson, Carrollton, Plano, Garland and other North Texas cities, this zip line is the perfect attraction. The Amazon Zip Line weighs over 2000 lbs. Setup typically can be done in an hour. We can set up indoors or outside with the appropriate clearing heights. For a rule of thumb on number of riders on the course to be about 1 to 2 per minute. We like to provide this range since we know that fun and safety takes time. At the top, a Star Walk of Dallas staff member instructs the rider on where to stand to wait for their turn. Once the harness is ready for the rider, our staff instructs them to sit in the harness. Our Star Walk of Dallas staffer then buckles each side of the harness. The rider is off gliding through the air. At the end, a stopper slows the riders descent. The inflatable wall helps to stop the rider. A Star Walk staff member then helps unbuckle the Zip Line. Finally, the rider jumps down onto the soft inflatable surface. The rider then exits the Amazon Zip Line. Then, the riders typically get back in line to enjoy the fun over and over again. This is a fun ride. Everyone likes it. We think it is fun. You will also. Rent the Amazon Zip Line for your next event. Cities served include in North Dallas in Allen, Argyle, Celina, Colleyville, Coppell and Fairview. We also serve Flower Mound, Frisco, Grapevine, Highland Village and Keller. Located in Keller, Lucas, Murphy, Parker, McKinney or Plano, Richardson University Park or Highland Park? We serve those areas also. What about Prosper, Southlake, Trophy Club and Westlake? We come to you. East, West or South of Dallas, we can head your way to Fort Worth, Arlington, Addison, Garland, Rowlett, Rockwall, DeSoto, Grand Prairie, Irving, Rowlett and Farmers Branch.